The first Field General Court Martial held in the Regiment was on a sergeant who was sentenced to 90 days Field Punishment. Major E.K. Eaton - O.C. 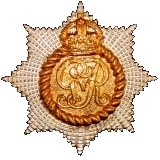 "C" Co.
Major C.R.E. Willets - O.C. "A" Co.
Capt H.F.R. Griffith - O.C. "D" Co.
Capt A.E. Willoughby - Adjutant. Capt F.G. Macculloch - O.C. "B" Co.
Capt R.E. Balders - 2nd i/c "A" Co.
Capt K.M. Holloway - 2nd i/c "B" Co.
Lieut H.M. Logan - 2nd i/c "D" Co.
Lieut H.B. Poston - 2nd i/c "C" Co.
Lieut V. Hodson - Platoon Commander "A" Co.
Lieut W.O. Carruthers - Platoon Commander "C" Co.
Lieut F.D. McCrea - Platoon Commander "B" Co.
Lieut A.C. Campbell - Bombing Officer. Lieut C.L. 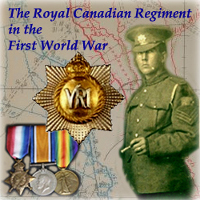 Wood - Platoon Commander "A" Co.
Lieut E.H. Simpson - Platoon Commander "C" Co.
Lieut W.T. Sapte - Platoon Commander "D" Co.
Lieut S.C. Bate - Platoon Commander "B" Co.
Lieut W.S. Fenton - Reserve Machine Gun Officer. Lieut J.M. Pauline - Platoon Commander "B" Co.
Lieut N.E. Towers - Platoon Commander "D" Co.
Lieut D.E. Munn - Platoon Commander "D" Co.
Lieut C.G.B. Thompson - Platoon Commander "D" Co.
Lieut F.R.L. de Salis - Platoon Commander "D" Co.
Lieut F. Dickson - Platoon Commander "C" Co.
Lieut R.B. Penniman - Platoon Commander "A" Co.
Lieut H.S. Brewster - Platoon Commander "C" Co.
Lieut E.E.N. McCallum - Platoon Commander "B" Co.
Lieut A. Snider - Platoon Commander "A" Co.
On arrival at Boulogne the battalion marched four miles to Ostrohave Rest Camp in the rain. The weather, if anything, was slightly worse the next day and [we] were soaked to the skin. On Wednesday Nov 3rd the battalion marched to Pont á Briques where it met the Machine Gun Section and Transport from Le Havre, and entrained at 10 a.m.
Bailleul was reached at 3 p.m. and the battalion detrained, marching to billets in the vicinity of Meteran west of Bailleul in scattered farms. Headquarters were established at "Chateau Seely" on the Meteran Bailleul road. On Nov 4th Lieut de Dombasle, 5th Can Bn., reported for duty on appointment from Bde. Machine Gun Officer, 2nd Brigade. On Saturday Nov 6th the battalion was inspected by Lieut General Alderson, C.B., Commanding the Canadian Corps which had at this time consisted of 1st and 2nd Cdn. Divisions. The G.O.C. Stated he was extremely pleased with the appearance of Canada's only regular Infantry Regiment, and welcomed them to the Corps. The strength on parade was 36 officers and 1006 other ranks. This Reserve was afterwards known as The R.C.R. and P.P.C.L.I. Depot. On November 8th the Adjutant, M.G. Officer, and Company Commanders went to Ploegstoert by motor to see the trenches held by the 1st Cdn. Division. On Nov 10th Lt Col Macdonell, the Commanding Officer, expressed a wish and approved by the old officers of the Regiment with the battalion that all officers of the 2nd and 3rd Battalions of the Regiment raised during the South African [War] of 1899-1902 be made Honorary Members of the Officers Mess. On 10th [Nov] the battalion marched to billets at Westhoff and huts at "Aldershot Camp" and "Bulford Camp" relieving the Canadian Mounted Rifles Brigade. From here the battalion went into the trenches at Ploegstoert opposite Messines by platoons for instruction with 2nd Cdn. Infty Bde, 1st Cdn. Division. On Nov 11th, two platoons "A" Co. and one gun of M.G. Section were attached to 8th Bn. C.E.F., and two platoons "C" Co. and one gun to 10th Bn. C.E.F. Opposite La Petite Douve, Nos 9 & 10 Platoons "C" Co. to 14th Bn C.E.F. of 3rd Cdn. Infty Bde, further north. On 12th [Nov] Nos 11 & 12 Platoons relieved 9 & 10. O 13th [Nov] "B" Co. and 13 & 14 Platoons "D" Co. relieved "A" Co. and 11 & 12 Platoons "C" Co. being attached to 5th and 7th Bns C.E.F. On 14th [Nov] Nos. 13 & 14 Platoons relieved by 15 & 16 Platoons, one man was accidentally wounded during this tour. (8-10 missing words) machine gunners was continued. The weather at this time was wet and cold turning to crispness and hard frost. The men though unprepared in many ways were throughout very keen and cheerful, and the reports sent on the battalion were not only satisfactory, but gratifying. The situation at this time was quiet, only slight hostile shelling taking place. On 16th [Nov] the first trench raid (handwritten insertion: "? P.P.C.L.I. 28-2-15") since the war began took place, carried out by the 7th Cdn Infty Bn, C.E.F., on La Petite Douve. A bombing party occupied a German Trench by night by Petite Douve Farm, after clearing it killing about 40 of the enemy, it retired with 12 German prisoners. This was done with one casualty and that one accidental. The expedition had been prepared by a wire cutting bombardment the previous day while part of the battalion was in the line for instruction, they were not, however, allowed to remain in for the Raid. The effect of this raid was great, it was the first example of offensive spirit on our part since trench warfare began and was the precursor of many many more offensive operations. These began as small expeditions by a handful of men at night growing to Daylight Raids of a Brigade by day which at first disturbed the enemy, later alarmed him and finally destroyed him. The Mark III Ross rifle which had been issued to the Regiment on leaving for France were soon found to be inferior to the Short Magazine Lee Enfield of the Imperial Army. Although they were excellent target rifles and so very useful for sniping, they were not adapted for handing by the average soldier under bad conditions. They were not suited for rapid fire and could not be depended upon for such use without jamming, this was first demonstrated by 1st Cdn Div at the second Battle of Ypres. The [Ross] was wholly unsuited unsuited for trench warfare conditions of mud and restricted areas. They were designed by civilians instead of soldiers and consequently possessed many simple and easily avoidable peculiarities making them awkward for a soldier to handle. They had not been issued before the war for trial and criticism by the soldier who can always discover some point which all the experts in the world will overlook. The First Division was re-amed with S.M.L.E. Rifle after the second battle of Ypres, the Second Division practically armed themselves by discarding the Ross and collecting salvage S.M.L.E. Rifles between Autumn 1915 and Spring 1916. The Third Division did likewise though not so successfully after the action at Zillebeke in June 1916. The whole Corps was re-armed in August 1916. A new soft pattern cap was issued together with waterproof capes, field bots, leather jerkins, and while in the trenches thigh waders were issued at this time. All sorts of articles, food and otherwise, could be bought at very low prices at the Canteens opened by the Army Service Corps, known as the Expeditionary Force Canteens. The Canteens were established at all towns along the line. It was forbidden for vegetables, etc., to be bought by troops locally on account of the necessity for Army requisitions of certain local articles. The institution and training of runners was commenced at this time starting with four per company, one machine gunner and one headquarters. This system of runners expanded during the war becoming highly trained and vital to all operations. On 18th [Nov] Lts Hodson, Pauline, Penniman and de Salis were attached to 10th Battalion C.E.F. (2nd Bde) during their tour of duty in the trenches on account of shortage of officers in that battalion at the time. On 19th [Nov] the battalion marched via Bailleul and Locre for La Clytte where they took over the camp and billets of 1st Cdn Cavalry Bde. 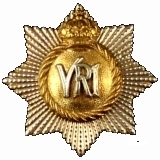 Here they formed part of the Corps Reserve and were employed on working parties and guards. Although La Clytte was periodically shelled no casualties occurred. On Nov 28th No. 477155 Sergt F. Carroll "D" Co. was killed while on a working party, this was the first battle casualty in the battalion. During wet weather there was a very natural tendency for men to walk overland to and from the trenches. This had caused many casualties especially officers and N.C.O's visiting various posts, etc. Strict orders were given that the greatest care was to be taken to prevent this unnecessary wastage.